After a month WhatsApp Play Store version has been updated from 2.12.250 to 2.12.304 with many new features and optimisations. This new version now comes with a much-awaited feature, Google Drive Backup, that can upload and backup all your chats and media files to your Google Drive. WhatsApp now has more than 1 Billion monthly active users which make it one of the best chatting application in Android platform. You can later on easily restore this backup to your local device without any problem. You can download the APK file from the direct link provided below. There is no need to uninstall the previous version; this APK file will automatically upgrade your old version. You can also get this update directly from the Play Store. The new version is 19.41 MB in size and has the major upgrade feature of Google Drive backup and restore. It also comes with many under the hood optimisations and improvements. We recommend you always to use the latest version of WhatsApp to get the up to date features and security. Please do not download the WhatsApp APK file from any unknown sources, either download it from Google Play Store or from to some trusted sources. Update: It seems that version 2.12.303 has the Google Drive backup feature and it was again taken down in version 2.12.304. We still have to wait for the confirmation; this might be due to location differences or might be WhatsApp has removed that Google Drive feature in WhatsApp 2.12.304. 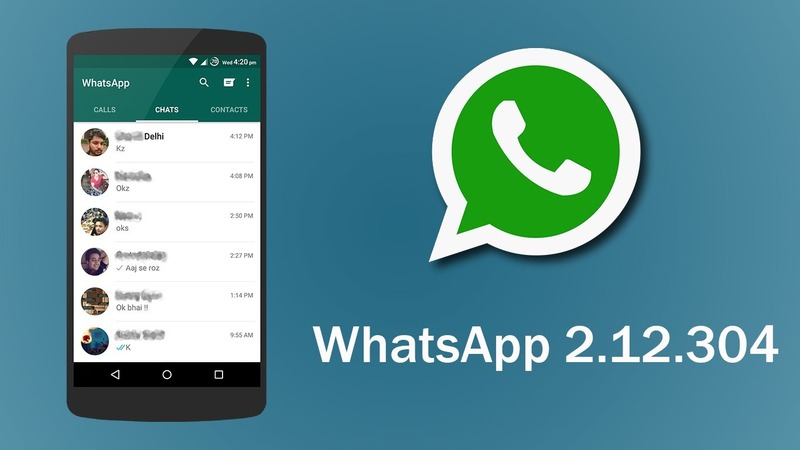 If you want to download WhatsApp 2.12.303 APK file, then please head over to our previous article. You can use the online backup feature in that version. To get the latest version of WhatsApp Messenger, stay tuned with us.